The FAI declined to outline the salary that John Delaney will now earn at the association after he stepped down from his role as chief executive last night to take up a new post. Delaney left the role with immediate effect after Ireland's clash with Gibraltar. He now takes up the newly created position of executive vice-president. 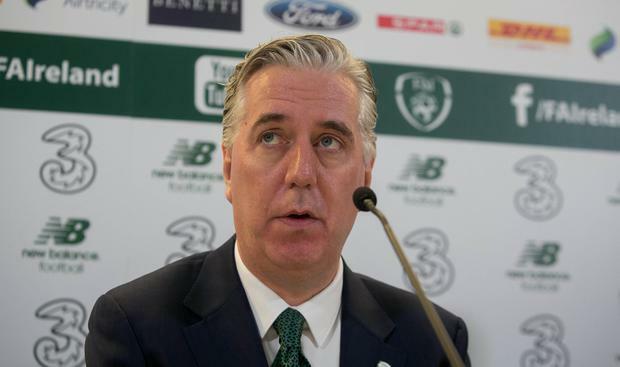 When asked by the Sunday Independent what Delaney and the new chief executive will now be paid, a spokesman for the FAI said: "That's all we're saying tonight." Sport Minister Shane Ross is believed to have privately admitted that he was unaware Delaney was stepping down before last night's announcement. A meeting of the FAI's board approved the changes on Friday. Delaney vacating his chief executive role, and the creation of his new post, both come after a difficult week for the association as it faced scrutiny about a €100,000 bridging loan he provided to the FAI in April 2017. It said the short-term loan was repaid two months later. Delaney was unsuccessful when he applied for an injunction to prevent details of the loan being published in the Sunday Times last weekend. Delaney said he "acted in good faith for the benefit of the FAI". Last night Delaney admitted that the past two weeks have not run smoothly for him. "This past fortnight has been very difficult for me on a personal and professional level and I would like to thank the board and my work colleagues across the FAI for their support," he said. "In recent days I have received many messages of support from the family of football, from many of the 2,000 clubs I have visited in my role as CEO, and from the world of politics and sport which I am grateful for. "It is time now for a new start and I am really looking forward to serving Irish football as best I can as executive vice-president." He said he is proud of his time as chief executive and claimed the association has improved during his tenure. He said the League of Ireland has improved "significantly" during his time in charge. He also pointed to the grassroots development of the game, work done on women's football and the move to the Aviva Stadium among his highlights. "There have been many challenges for Irish football in my time as CEO and I will be the first to acknowledge that - but I have always given my best for Irish football and I will continue to do that in this new role. "We have improved the League of Ireland significantly, we have introduced underage structures to the league, and we have offered our best young footballers a pathway to the top of the game in tandem with our Player Development Plan. "We have also brought women's football into the association and we have worked very hard in recent years to correct mistakes made and improve the women's game at all levels. "Our grassroots game is stronger now than ever before and we continue to deliver on our 'Football For All' policies thanks to the diligence and hard work of the staff at Abbotstown and across Ireland. "Since my appointment as CEO, we have built the world-class stadium that is the Aviva Stadium in partnership with the Government and the IRFU. We have hosted the UEFA Europa League final and next year we will host four games at Euro 2020, hopefully with Mick McCarthy and his Ireland team there in group stages. We have competed at European Championship finals and our fans have been recognised repeatedly as the best in the world." Last night the association said the review of its senior management structure followed a report, commissioned in February and carried out in recent weeks, which recommended the FAI makes changes to "put itself in the best position possible" for the years ahead. Chief operating officer Rea Walshe has been appointed as an interim chief executive as the process to recruit a new CEO gets underway. A spokesman for the association said the structural changes were recommended in the report carried out by sports governance expert John Hall, a former director of governance with the English FA. The report says the chief executive and executive vice-president "would need to work closely together in a collaborative manner". Last week the association and Delaney faced persistent questions about the €100,000 bridging loan. The FAI was forced to make a series of statements about corporate governance, management structures, and respond to queries from Sport Ireland, the ODCE and the Oireachtas Committee on Sport. Sport Ireland CEO John Treacy wrote to the FAI on behalf of Transport and Sport Minister Shane Ross seeking clarification about the loan. The FAI said it responded to these queries. Just when you thought things couldn't get worse . . .